He dances. He plays the piano. He makes people laugh. He inspires. ArchieMIAlive caught my attention due to his incredible dance moves-- then I heard him play the piano. I guess music is definitely keeping him alive. 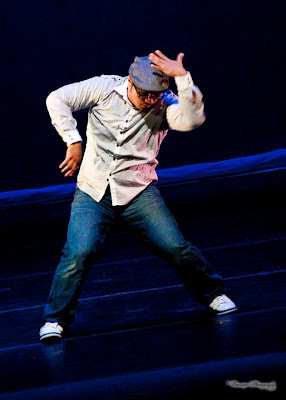 Through his videos and posts (Facebook or Twitter), I felt his great passion towards dancing. He makes it fun for everyone, at the same time, he respects the art and embraces it along the way. He believes that you should never stop yourself from taking chances, because every step brings you somewhere. Let's get to know ARCHIE! - I started my first YouTube Channel "n1nebreaker" in 2006. I opened a series of channels for my different projects, but decided to stay with "ArchieMIAlive" because I feel like my most progressive works have been captured there. - I decided to share videos online when I felt like YouTube was becoming "the thing" to do. That's my honest answer at first, but then I got to thinking that I could keep the videos online for me to keep track of my personal progress as a dancer and as a person. You know how our parents used to keep tapes among tapes of home movies? Well this is pretty much my version, and I just want to share what I see with everyone. - ArchieMI (M.I. are my middle and last initials) Alive - exactly what it means. haha! ACTUALLY, it's my contact e-mail also. What videos does your channel offer? - My channel currently offers Personal Vlogs of my life including my travels overseas as well as to various dance training sites. The vlogs are my spin on things, I do my best to accurately portray how I saw everything at that very moment. I also have many dance choreography videos of myself and the teams that I choreograph for. I'll throw in some slight comedic skits as well as personal opinions and rants. It's quite a mishmash of things. I suppose it's a little something for everyone. - This video is blocked in the States so for you Aussies and anyone who reads this NOT in the USA, feel privileged! It's the summation of my entire 2011. It's a reel of all my clips from the year to show all my progress and everything I'm blessed to be surrounded by. What is your goal in Youtube? - My goal in YouTube is not to be the best at what I do but be the happiest doing what I do. I hope to inspire anyone who comes across my videos. I personally never thought of doing it for the money or fame. I just want to share everything I've worked hard at doing with anyone who is willing to give me the time to watch it. What is the inspiration behind your dancing? - Dancing has always just been a big part of me. I'm always challenging myself to do better than I just did. Other people are my inspirations. It's not just other great dancers but everyday people as well. I see how hard they work and be great at what they do, and I just want to be at least halfway decent at what I do. Dance is supposed to be fun. It carries emotion. It takes it away. It creates a feeling. It expresses everything words can't say. When I'm inspired and have no words, I just dance it out. - Talent? LOL! I personally don't think I'm very talented, but I suppose it came naturally from when I trained in music starting at the age of 7. Whenever there was music videos playing on tv, I would just copy whatever they were doing. Maybe it started there... lol! It seems like dance was always in my life that I guess i can't remember exactly when I started. - I hope you get to know me through my videos and as I keep sharing and progressing in my craft. I'm thankful for anyone that takes a minute to watch because that means you took a minute to get to know who I am. More so, I just want to say that if you're inspired to do something and if there's something you want to do, don't hesitate to try. Life is short sometimes, and we may not always get the opportunity to do the things we wanted because we hesitated. It may be scary to just jump into something, but I assure you as long as you're confident in your endeavor, you'll be glad you tried whether or not it happened the way you wanted. I'm just blessed to have people in my life who endlessly inspire me to take chances. I hope you find it for yourselves as well. Thank you so much Archie for the time! You gave a good message to anyone who has a huge dream and just needs a little push. I wish you all the best, and may you dance your way to your greatest achievements!